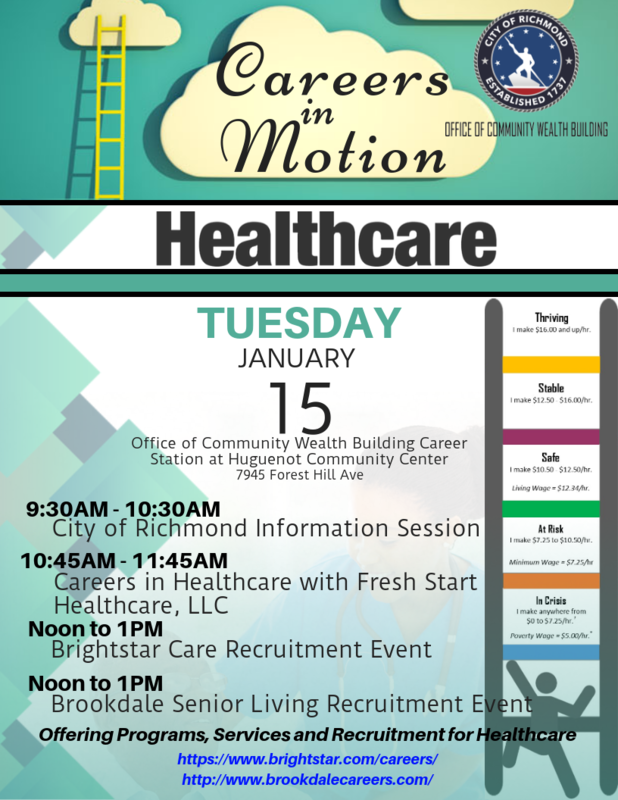 This (930am-1pm) Event is called Careers in Motion: Healthcare with a (930-1030am) Information Session for those interested in Workforce Development with the City of Richmond Career Advisors, a (1045-1145am) Careers in Healthcare Session with a Healthcare Subject Matter Expert from Fresh Start Healthcare, LLC and a (12-1pm) Recruitment Event with BrightStar Care and Brookdale Senior Living. (930-1030am) Information Session with the City of Richmond Career Advisors, Discussing a No Cost to Participant to Address Roadblocks to Finding Employment while gaining Job Readiness and Occupational Skills. (1045-1145am) Careers in Healthcare Event with Fresh Start Healthcare, LLC Discussing Labor Market Information for Job Descriptions and Job Titles in the Healthcare field including PCA, CAN, Med Tech, Phlebotomy, and LPN. (12-1pm) Recruitment Event with BrightStar Care for Job Opportunities in Caregiving, Nursing and Office Team. (12-1pm) Recruitment Event with Brookdale Senior Living for Job Opportunities in Activity Coordinator, CNA, Dining Services Coordinator, Medication Aide, LPN, Physical Therapist, PRN, and RN.